At Santa Barbara City College, Garvin Theatre, Saturday, October 20. Daniel Salinas is a pupil of Sister Clarissa (Marion Jessup Freitag) in SBCCTG's <em>Over the Tavern</em>. Tom Dudzick’s irreverent comedy Over the Tavern is set in the 1950s in Buffalo, New York. While not exactly nostalgic, the play is based on Dudzick’s rigid upbringing as a Polish boy in a Catholic parochial school. In the opening scene, the austere sound of an organ sets the mood of the St. Casimir School. 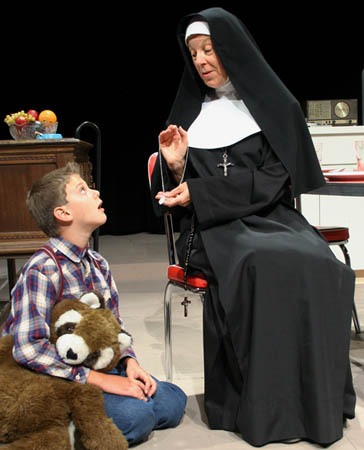 There, Sister Clarissa (Marion Jessup Freitag) wields her authority over 12-year-old Rudy Pazinski (Diego Paul Ochoa) with a ruler, a clicker, and threats of fire and brimstone, but Rudy refuses to become the victim of his oppressive environment. Precocious and spirited, he questions these norms and challenges the school’s establishment. Yet the school is not the only unhappy place in young Rudy’s life, as the Pazinski family dynamic makes his life intolerable as well. The scenes in which Rudy kneels at a church pew in ardent prayer for more felicitous relationships are among the best in the play. When at home with three complicated siblings, an exasperated mother, and a temperamental father, Rudy imagines that he is Ed Sullivan, his television hero. Diego Paul Ochoa is delightful, not only demonstrating a talent for comedy, but also immersing himself completely in the role of Rudy. Three other young actors make their SBCC Theatre Group debut in this show. As Rudy’s eldest sibling, Eddie, Kameron Tarlow portrays a rebellious, confused teenager with passion and conviction. Rebecca Jacks is Annie, Rudy’s impressionable sister who is addicted to Hostess Twinkies. Her beehive hairdo-which her mother likens to the Pope’s hat-is hilarious. The emotional rollercoaster of the mother-daughter relationship is accentuated as Ellen (Kelly Coyle) alternates between comforting Annie and attempting to control her. Fortunately for everyone involved, the emotional demands of the show are tempered by just the right amount of humor. When Sister Clarissa pays an unexpected visit, Eddie rushes to confess his “impure thoughts,” only to discover that Sister is actually concerned about little Rudy. Complex and multilayered, the comedy Over the Tavern revisits an era when it seemed that fathers knew best, but in doing so it exposes a simultaneous need for change. The play ends with a song by Elvis Presley, whose scandalous hips nevertheless found their way onto Ed Sullivan’s show. Elvis is a fitting symbol for Rudy’s newfound freedom.